Harris Doyle Homes, the renowned residential builder based in Birmingham, Alabama, is one of two top builders chosen by Allen Harris to help realize his vision for The Springs of Mill Lakes, the active living community in Opelika currently under development. A number of innovative, easy-living homeplans are offered in this gorgeous 55+ neighborhood, including The Mayfield Plan that Harris Doyle Homes just added to the mix. This spacious, 1,850 sq. ft. single-level home includes three bedrooms and two baths plus a two-car garage, and is a happy combination of the cottage and craftsman styles that today’s buyers appreciate. The home’s lovely exterior features brick and board and batten accents. When you enter the home, you immediately notice the home’s open floorplan that emphasizes the spacious kitchen and dining area. The kitchen’s expansive center island is great for serving and entertaining, and a great spot to add extra bar seating. The well-designed kitchen opens into a large living room that is centered around a beautiful fireplace. Just off the side of this great room, on the same side of the home as the master suite, is a hallway leading to an additional full bath on one side and laundry area on the other and two additional guest rooms. The large, elegant master suite has a lovely en suite 4-piece bathroom with soaking tub, dual vanities, separate shower and private water closet. A generous master closet completes the master suite. The Mayfield’s oversized double garage also has extra room, perfect for a golf cart, workbench or additional storage area. There is also a large covered porch and additional outdoor storage room to the rear of the great room, perfect for those gardening tools or patio storage. The Springs of Mill Lakes is a master-planned residential community of 134 single-family custom homes, specifically designed to appeal to the active 55+ homeowners who seek an easy-living lifestyle surrounded by nature. In addition to 67 acres for active 55+ living, The Springs of Mill Lakes also encompasses a 13-acre senior living campus community and a 45-acre perpetually protected wildlife sanctuary. 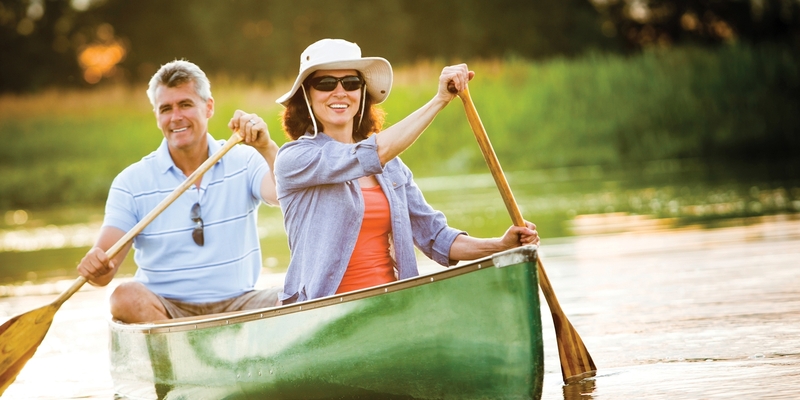 The community’s natural setting includes two 3.5-acre mature lakes, one for recreation and one stocked and managed for fishing, as well as a wandering creek. To learn more about The Mayfield by Harris Doyle Homes and about this beautiful 55+ neighborhood surrounded by nature and to add your name to our VIP interest list, please visit www.TheSpringsOfMillLakes.com.